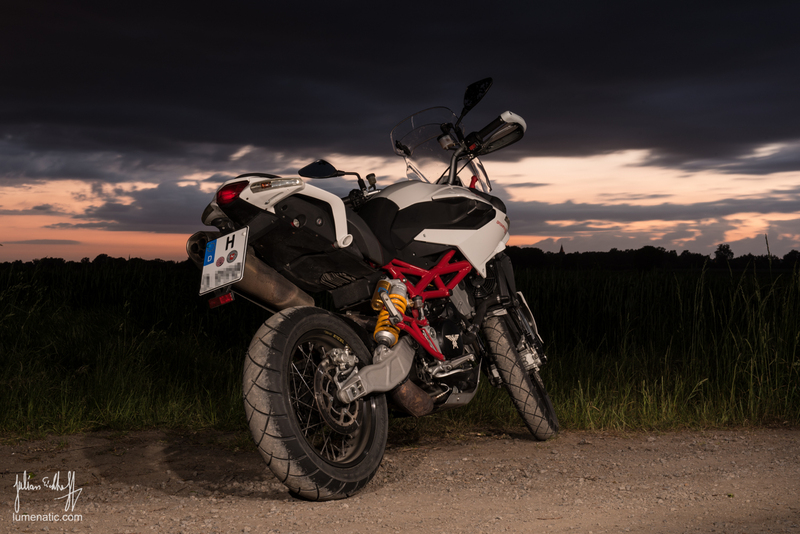 This is part 2 of the big motorbike photography series. If you haven’t read part 1, click here. Last week I showed Japanese motorbikes, this week belongs to the Italians. 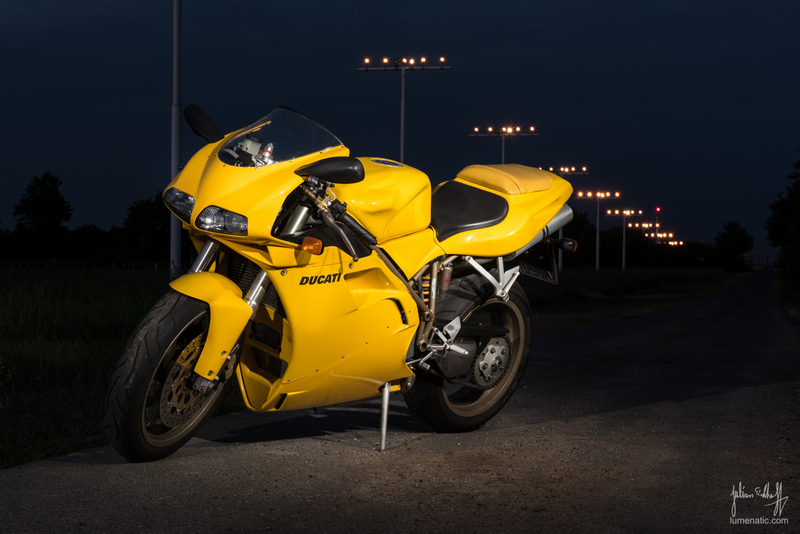 The following images depict a Moto Morini Granpasso 1200 and a Ducati 748 S Biposto. 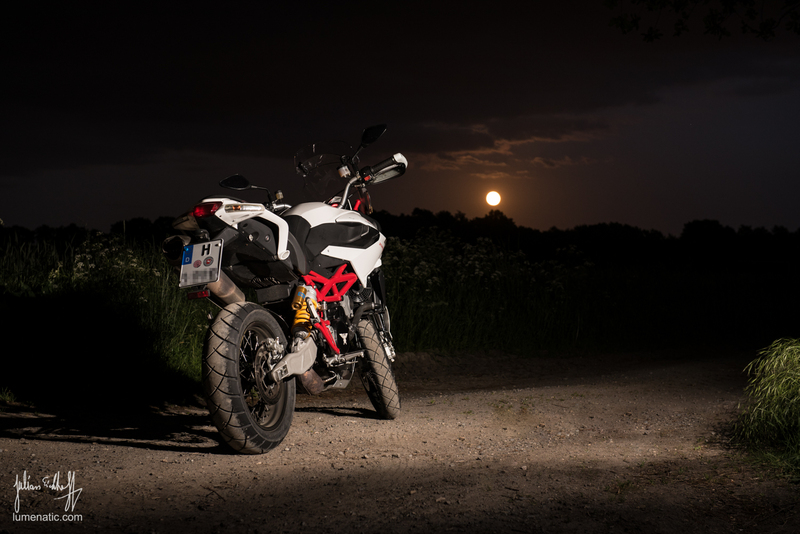 In contrast to the motorcycles in the last post the italian bikes were shot in an environment with no street lamps, so I had to make everything with flashes. First, let’s go through the three key elements for this shoot. Location. 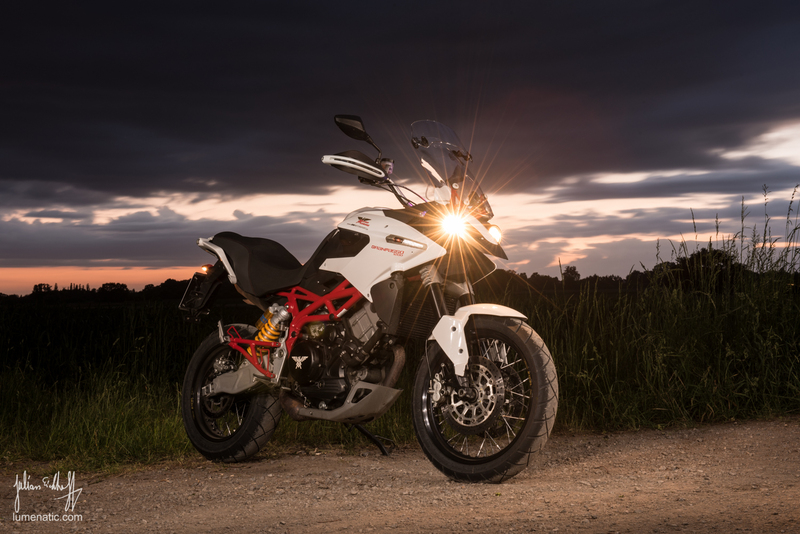 The Moto Morini Granpasso is a travel enduro with 1200 ccm. That means it is built for rough terrain and going cross country. Therefore I chose not to photograph it on a paved road but on a small dirt track next to a field of wheat in the countryside. The dirt track attributes to the character of the bike, the open field provides a nice backdrop with little distraction. Lighting. 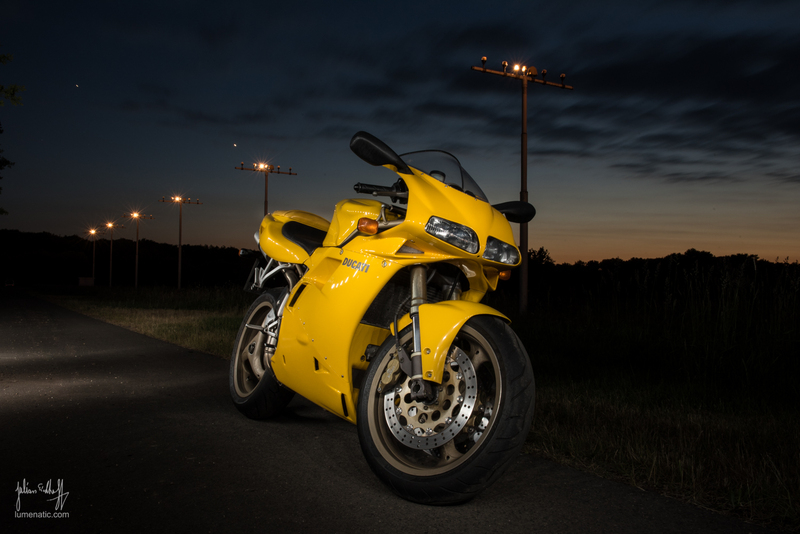 The shooting took place after sunset, with some residual light gleaming over the horizon. This provided a nice atmosphere, but also meant that the shooting had to take place late in the evening (way beyond 10 pm). 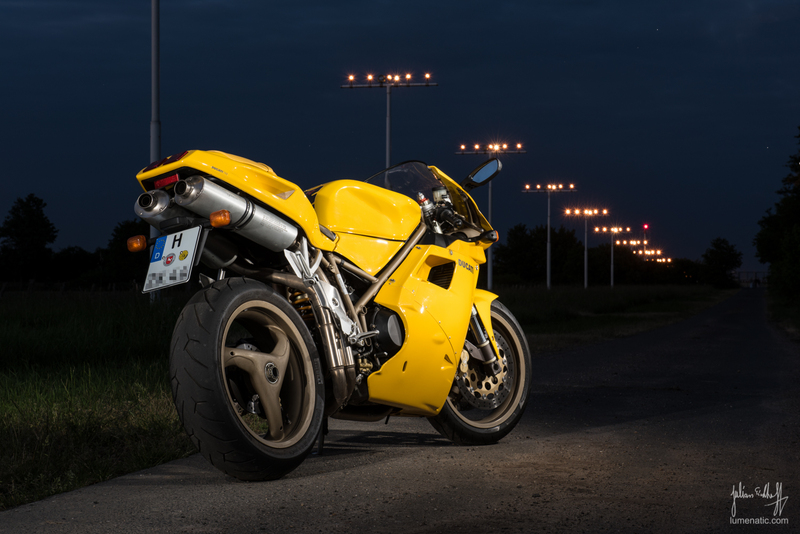 The foreground was lightpainted with handheld flashes, set to manual mode and also trigered manually. The flash power was set using the famous trial and error method, aka chimping. Perspective. I wrote about that in the first post of the series, nothing new here. Camera at roughly the height of the bike’s tank, bike at an angle of 30, 45 or 90° towards the camera axis. How the shoot took place. 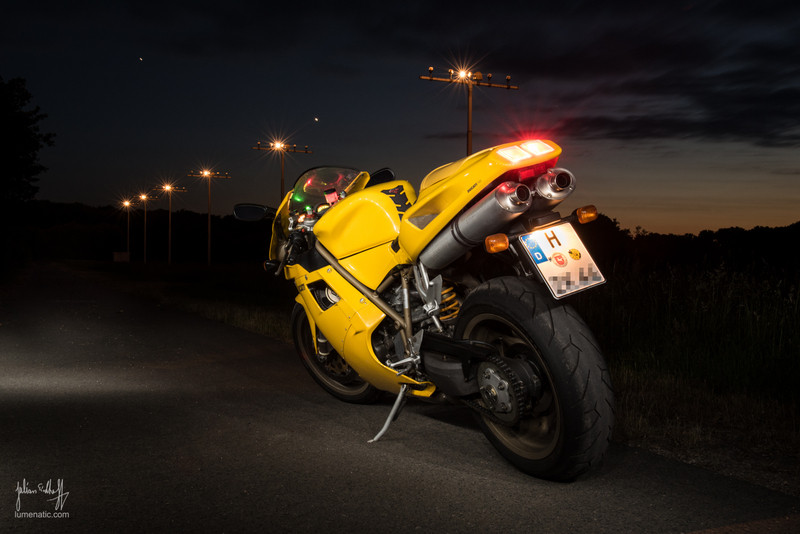 The camera was set to 30 sec exposure and the aperture closed to the max to achieve the nice “beam”-effect at the bike lights. After starting the exposure (exposure delay mode again activated to avoid disturbance from the pressing of the shutter button) I moved around the bike in a half circle behind the camera, firing my flash several times to light the bike. That is the basic recipe, the rest is playing with the flash power, flash zoom, number of flash impulses and where to point the flash. 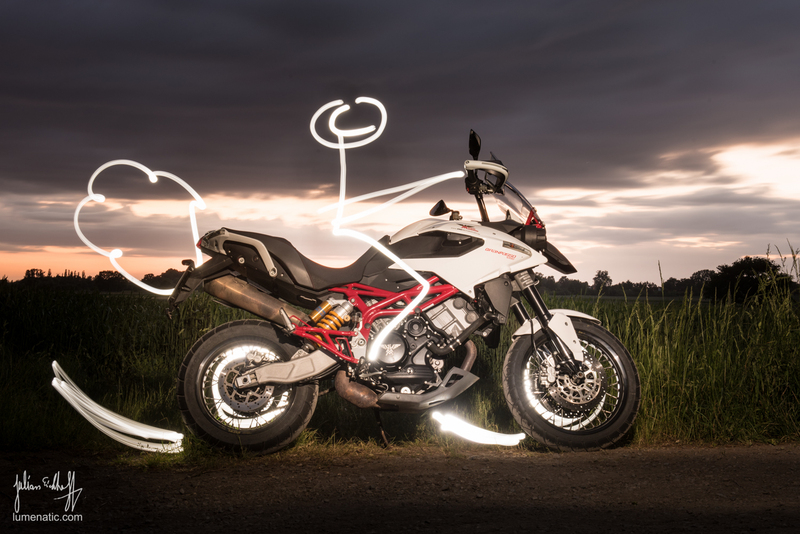 After lightpainting some action on the Kawasaki I wanted to knock it up a notch. So I made another 30 sec exposure and started lightpainting the exhaust fume cloud, wheels and the driver. All had been done in one take, no composition in Photoshop. You have to work fast, but it is absolutely feasable as 30 sec last longer than one would think. I am totally in love with the next two images. It was quite late already and the moon began to rise behind the treeline in the opposite direction where we were shooting. So we rotated our setup by 180° and made some exposures with the moon in the background. In order not to overexpose the moon I dialed the camera settings to 2 sec exposure @f/6.3. Longer exposure modes would have lead to a non-circular moon as he moves a noticeable way in 30 sec. 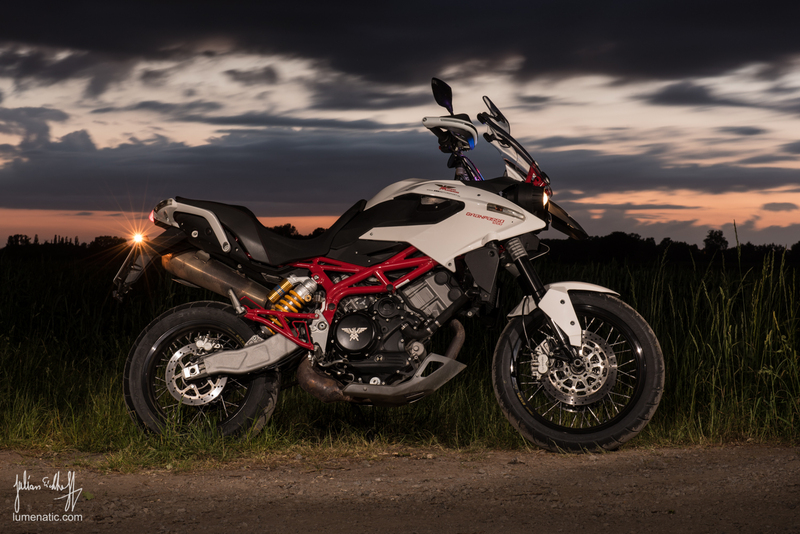 The bike and the surroundings were then lightpainted as described above. Since the aperture had been opened a great deal the flash power could be reduced significantly. Second italian stallion. 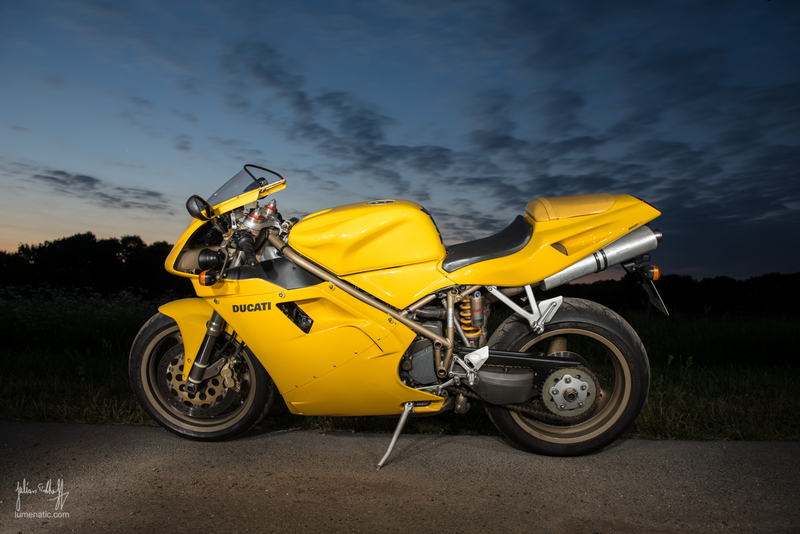 A Ducati 748 S Biposto. 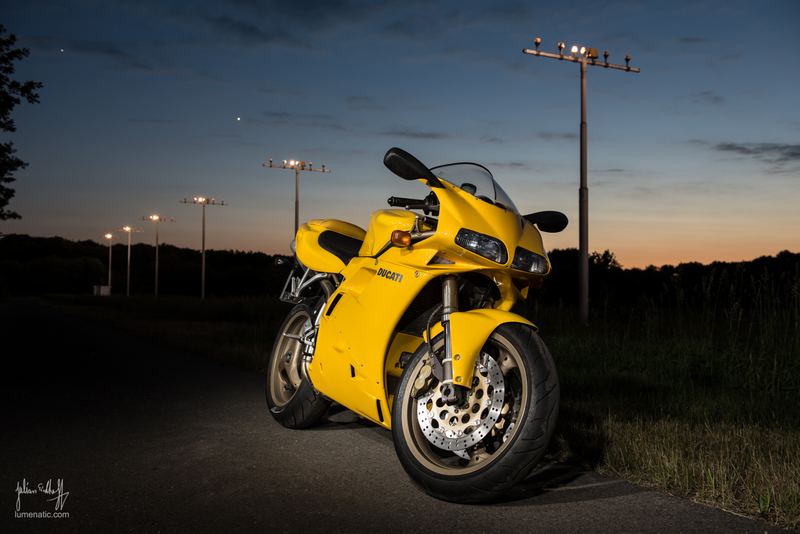 It’s a yellow crotch rocket (“Rennsemmel” in German, which translates to a “Racing breadroll”. Us Germans are weird, I know). Let’s break down the shots for the last time: Location. The road is the extension of the northern runway of Hanover airport. The road with the signal lights is outside the airport perimeter and therefore totally legal to enter. We chose the location because a.) there is little distraction in the background and b.) the signal lights are an unusual sight and therefore interesting. Lighting. Besides the signal lights no other light source was present. We shot way after sunset with only a small residue of daylight gleaming over the horizon. 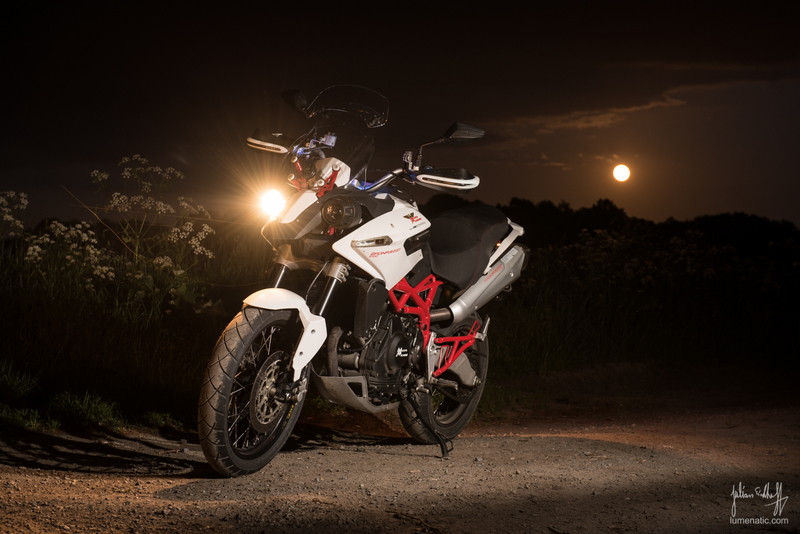 The bike itself was illuminated by lightpainting with a handheld flash set to manual mode as described earlier. Perspective. Facing west the sky is a deep blue (magic hour). 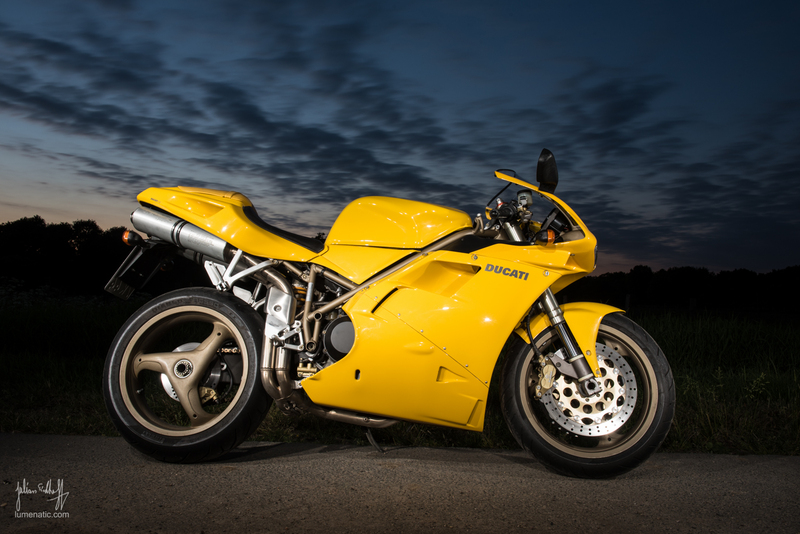 The bike was positioned in the classic 30/45° or 90° perspective. While the deep blue is nice let’s take a look into the opposite direction… as you see the residual light over the horizon adds to the atmosphere. The path before the bike was also lightpainted with the flash. Suddenly the airport guiding lights were shut off. To achieve another lighting mood I opened the aperture to f8 and adjusted the flash power accordingly. While the photo has been shot in the same direction and at roughly the same time as the image before, the altered exposure makes the image look more dusk-ish and less night-ish. Bottom line. Choose a good location. Be there when the light is good for your shoot. In my case I chose dusk, the magic hour and beyond. Position the bike in such a way that its character is reflected accordingly. Play with the exposure, use a flash and/or lightpaint the scene.